Take 12 of my 5 on the 5th project for 2013 and I loved every moment captured! You can see all my entries here. 1 | It's Wacky Tacky Day for Spirit Week at school. These girls of mine are always wacky, but getting ready this morning was so much fun for them as they let their inner tackiness take reign! I love their enthusiasm and creativity. Not sure I was as wacky at that age. Don't know that I'm all that wacky now, but love that they are. 2 | Walking back from feeding the barn kitty, Mommy Boots, because I forgot to stop the car and let Isabella out to do it before biscuits and gravy for breakfast at school today, I looked up and saw this beautiful shot. I love that it's been in the family for 50 years and we're lucky enough to call it our home now. Hopefully it will still stand once we no longer live here. 3 | Meet Snowflake, our not so mischievous Elf on the Shelf. It's our first year with Snowflake and so far, she's been quite entertaining. One thing is for sure, Isabella and Victoria are up and at 'em early every morning trying to find where Snowflake has landed after her long night. 4 | When Zach was younger, we would decorate the tree together and I would secretly rearrange ornaments so that it was "perfect." Now, I let the girls decorate and don't move a thing and it's still a beautiful tree. Sure, we have spots with lots of ornaments and then…well you know the rest of the story. Love our tree. And if you 're reading this, sorry, Zach. 5 | Christmas bedtime stories in our bed, which is a rare happening. Now, though, they take turns reading to us most nights. And it warms my heart to hear them say, as they unwrap their books each night, "Oh, this is my favorite, Mommy! How did you know?" I'm doing really well this year not getting too melancholy about Zach being away from home and remembering when it was him who was reading most of these stories. 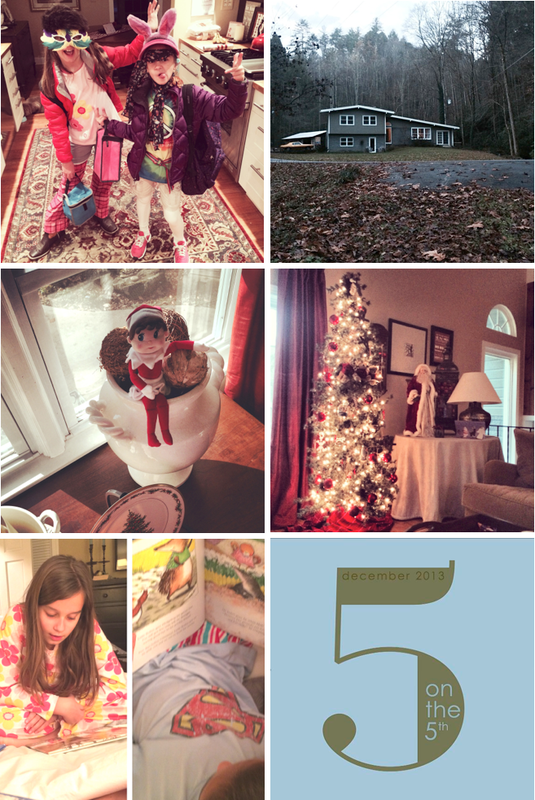 If you're new to the blog and want to know more about 5 on the 5th, read this blog post. If you post about your own #5onthe5th, leave a comment so I can drop by for a visit!